Happy Monday friends!!! Despite the gloomy Monday in Seattle I’m super stoked going in to this week! Our countdown to Coachella / Palm Springs is ON and Game of Thrones premieres this weekend!!! Anyone else a Game of Thrones fan? I’ve only gotten in to the show within the last few years, but at completely hooked. Ummmm hello….Jon Snow?! I digress….With all things spring on my mind, I’ve been thinking, and shopping, a lot for spring pieces to build up my wardrobe. Spring brings forth the most amazing fabrics and prints and I am ready and waiting to wear them! 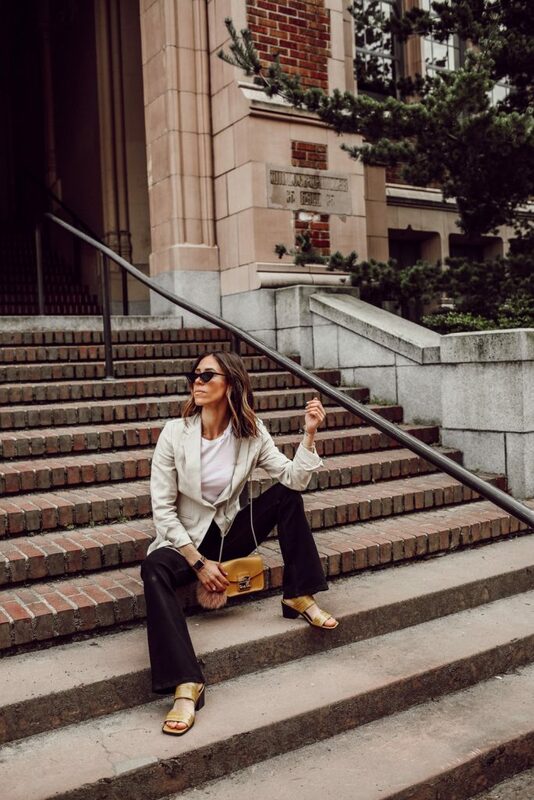 Today I’m sharing how to style a linen blazer for spring – this look in particular is a great one for every day and even for work! I have a love / hate relationship with linen – most’y because I’m super Type A and absolutely despise wrinkles. However, it’s one of those amazing fabrics for the warmer months that lets you breath in the heat and gives off such a relaxed effortless look! 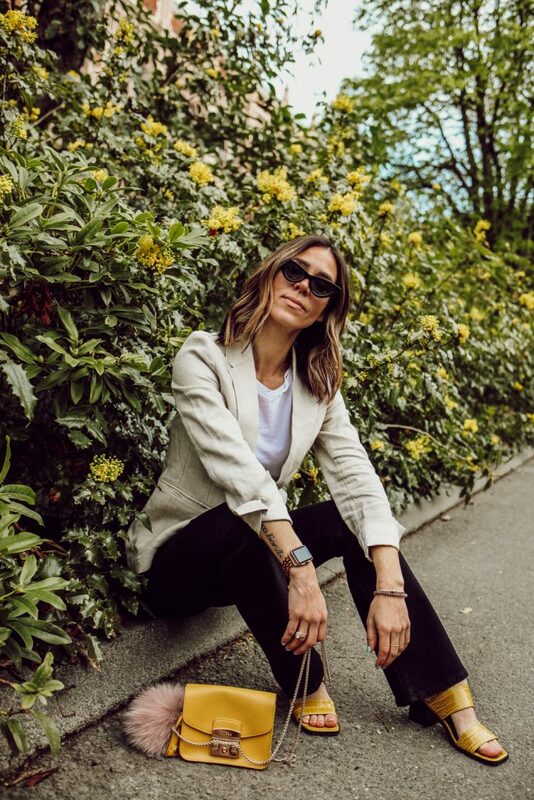 This Linen Blazer (similar), and sorry the one from H&M in this post already sold out, is the perfect piece to add to your spring wardrobe. If you are look for versatility, this is your piece! Style it for work, play, travel, you name it! A linen blazer is one of those pieces can that quickly elevate a look no matter where you are headed. 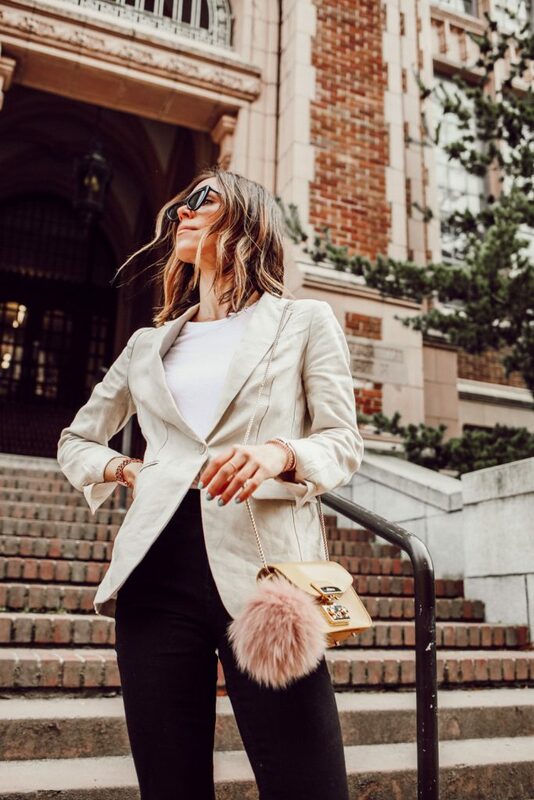 If you want to see more ways to style this blazer, head to my instagram stories later today! I never tough that I would say this, but I think that I’m back on the flare denim trend. Side note, it’s also crazy to see trends make their rounds in your life time….for my dad this is the third time! These Mini Flare Denim are the perfect way to dip your toe in to the trend by not over committing yourself with a LARGE flare! For $29.99, how are you resist? These yellow sandals are currently an ADDITIONAL 20% off at Urban Outfitters. I bought, and wore them, for our trip in Japan – not only are they comfortable, but the color and square toe are super on trend!!! If you aren’t in to yellow, they come in four other colors! Finally, if you guys know me, you know that I exclusively wear these sunglasses, and have for a few years. I found this set on Amazon for $7.99!!! You can buy two pair for the price of one! You can never go wrong with a cat eye sunglass – they are flattering on all face types!